Vector drawing program for creating publication-quality EPS illustrations. Mayura Draw is a vector-based drawing program. Unlike bitmap-based "paint" programs, vector-based drawing programs define each object that constitutes the drawing by its co-ordinates and not by pixels. This enables drawings to be modified easily. Vector based drawings also print at the highest resolution supported by the printer. Using Mayura Draw you can create illustrations composed of graphical shapes such as rectangles, ellipses, polygons, bezier curves, images and text. Mayura Draw has powerful tools for editing and transforming graphical shapes. All shapes including images and text can be scaled, rotated, skewed and reflected. Mayura Draw supports editing bezier curves by manipulating handles. Mayura Draw was built from the ground up to generate clean PostScript. You can export drawings in EPS format for easy inclusion in LaTeX, Microsoft Word, and other word processors. SVG files generated by Mayura Draw 4.5 are compatible with Internet Explorer, Firefox, Chrome and Safari. Mayura Draw can export your drawings in Adobe Illustrator (AI) format. It can also import AI files created by other applications such as Mathematica and gnuplot. Import: AI, WMF, GIF, JPEG, PNG, TIFF and BMP formats. Export: SVG, EPS, PS, AI, PDF, XHTML, WMF, EMF, GIF, JPEG, PNG, BMP and TIFF formats. Compatibility: Windows 10, Windows 8, Windows 7, Vista, XP. LaTeX friendly: EPS files generated by Mayura Draw are suitable for including in LaTeX documents. 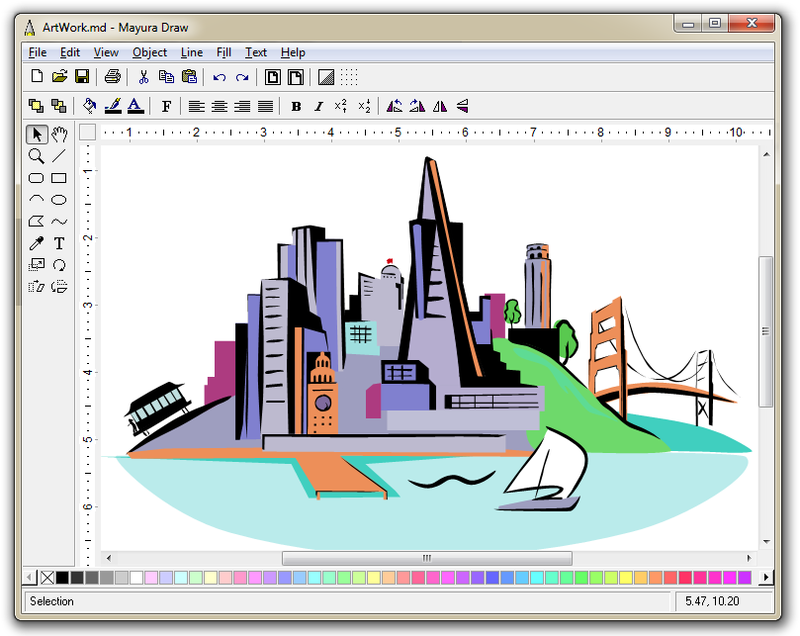 Mayura Draw 4.5 can create XHTML files containing vector graphics. XHTML files can be opened in all modern web browsers including Internet Explorer, Firefox, Chrome and Safari. Ghostscript & GSview, a free PostScript interpreter and previewer.